Quick pickles, also called refrigerator pickles, are unfermented pickles made by marinating vegetables or fruits in a vinegar or salt solution for a short period of time, usually several minutes to a few days. They don’t require canning if they won’t be stored for more than a few weeks, though they should be refrigerated. Usually recipes for quick pickles are simple and require minimal effort — often just cutting, mixing, and waiting. Slightly more complicated recipes may require blanching or may require the brine to be heated to dissolve sugar or salt, infuse flavorings, or lightly cook the vegetables. Examples of quick pickle recipes can be seen here (Mark Bittman), here (Food52), here (Smitten Kitchen), or here (The Awl). This quick pickle is recipe is one of the simplest types; it requires only cutting and mixing ingredients. These pickles get a mouth-puckering sourness and floral aroma from umeboshi, Japanese salt pickled plums. Since umeboshi is pungent, it can be an acquired taste; I love it because it makes these pickles unique from other refrigerator pickles. These pickles are best served besides plain Japanese white rice, though when eaten on its own, its pungent sourness can be pleasing because jolts you awake. I use a special Japanese cutting technique, called the serpent’s belly cut, since it makes the cucumber tender but still very crunchy and it looks pretty. However the recipe also works if the cucumbers are simply sliced. Recipe inspired by “Quick Cucumber Pickle With Ginger and Umeboshi” by Ayako Iino of Yumé Boshi. 2 Japanese cucumbers, Mediterranean cucumbers (available from Happy Quail Farms in the Bay Area), or similar type of cucumber, which is preferably small (about 6 inches long), not very thick, thin-skinned, seedless, and 2-1/2 to 3 oz each. If substituting seeded cucumbers, see the note below. If using a different size of cucumber, adjust the seasonings accordingly. Cut the cucumbers using the serpent’s belly cut described below, or into thin slices, half moons, or a similar shape. The sliced cucumbers should be salted or soaked in brine, as described below, in order to draw out their extra moisture which would otherwise dilute the pickle’s flavorings. If using the serpent’s belly cut: Cut the cucumber crosswise into small pieces, about the size of one or two bites. Cutting it into bite-sized pieces before it is soaked in the saline solution will make cleaner cuts since the cucumber is firmer. Soak the cucumbers in 2 cups water mixed with 2 tsp salt for at least 30 minutes. It is easier for this saline solution to get between all the slices and pull the moisture out than mixing the serpent’s belly cut cucumbers with just salt. If using another cut: Mix a generous pinch of salt with the cucumber. After 30 minutes the cucumbers should be semi limp (if not, stir in some extra salt and let them sit for a few minutes longer). Drain, rinse off the extra salt, and then gently squeeze to remove excess water. This prevents the pickle from getting watery. Don’t squeeze hard enough to mash them; it is okay for a small amount of liquid to remain. Remove the seed from the umeboshi and smash the pulp into small bits with your fingers or a fork or mince with a knife. Mix the smashed umeboshi, ume vinegar, and the cucumbers. Taste and add salt if necessary; the umeboshi is salty so it most likely won’t need any additional salt. The pickles can be eaten right away, which is how I like them best, or they can be kept for up to five days if refrigerated. They will get more pungent and sour the longer they are stored. Serving suggestion: Serve with hot steamed Japanese rice. Variation: If substituting cucumbers with seeds, then halve the cucumbers lengthwise and use a spoon to remove the seeds. Cut into half moons. 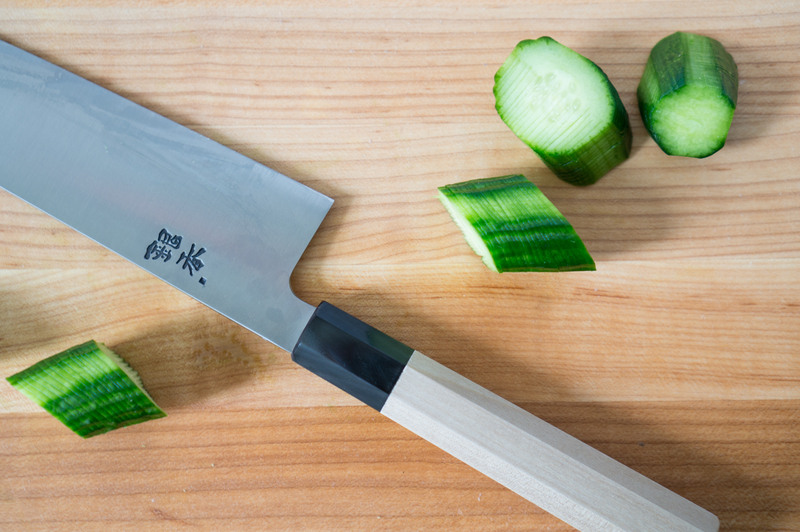 In Japan, this cut is usually used only for cucumbers. This type of cut makes the cucumber malleable like a serpent or an accordion and gives the cucumbers an interesting shape. It makes the cucumber tender but still very crunchy. The resulting pieces has great texture and the folds hold the marinade well. A seedless cucumber must be used, since there is no way to remove the seeds when using this cut. seedless cucumbers, preferably Japanese, Mediterranean, or other type of seedless cucumber, which is preferably thin-skinned and not very thick. Cut the ends off the cucumbers. Optionally rub the cut surfaces of the cucumber end and cucumber against each other and wipe away the froth that forms — supposedly this technique helps pull out bitterness from the cucumbers. Optionally use a vegetable peeler to remove alternating strips of skin. This creates a varied and interesting texture and appearance. Removing some of the skin also makes the cucumbers more tender. If you have one, I recommend using a serrated peeler since it makes pretty ridges which echo the ridges of the serpent’s belly cut. Place the cucumber horizontally on the cutting board. 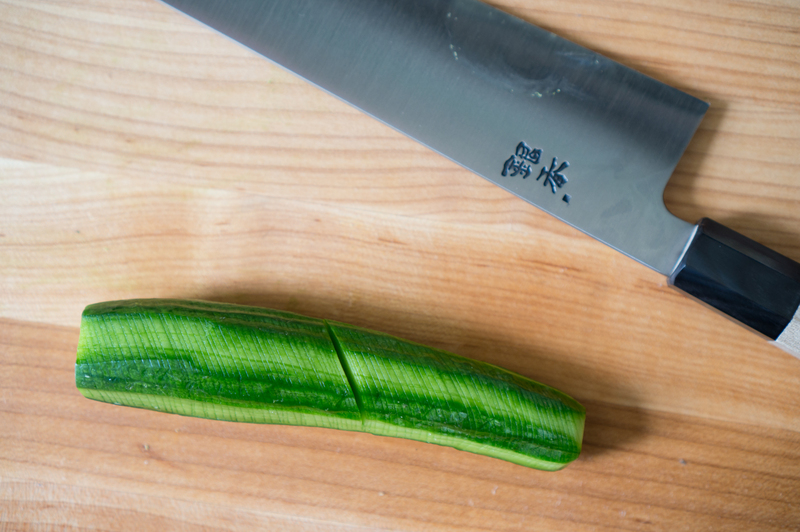 Position the tip of knife to make diagonal cuts (slanting from northwest to southeast for right handed cooks) starting from the right side of the cucumber, with the tip of the knife on the cutting board and the heel in the air. Leave the tip of the knife on the cutting board to help steady the knife and move the heel of the knife in the air to make thin diagonal cuts halfway through the cucumber at narrow regular intervals as you move the blade down the cucumber, from right to left. You can curl the index finger of your free hand against the side of the blade to help make the cuts more regular. It is important to not cut more than halfway into the cucumber. 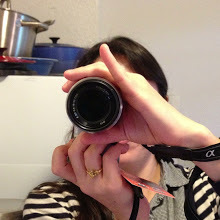 Continue all the way down the cucumber. Carefully turn the cucumber lengthwise end over end and repeat, making diagonal cuts in the same direction and same slant as before on the uncut side of the cucumber. The cucumber should now be pliable like a serpent or accordion. Persian cucumbers are really close to Japanese ones. I make my own umeboshi so always have some on hand. Sometimes I crumble some dried shiso leaves on the cukes when served. Homemade umeboshi and cucmbers sounds amazing!